> When Math Gives You Word Problems – Make Sense of Them! When Math Gives You Word Problems – Make Sense of Them! 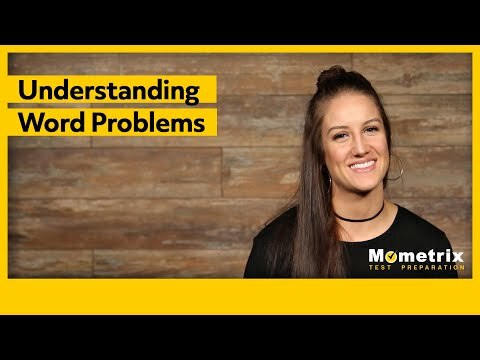 Hey guys, welcome to this video on word problems. Math problems can be hard, especially when you have to convert word problems into actual mathematics. Typically, as soon as you figure out the equation you’re working with, then everything is easy peasy. Getting to that point, however, can seem overwhelming at times. In this video, we will discuss several different clues to help you convert English into math. You will still need to practice, however, in order to identify these hints as you come across them. Practicing will help you become familiar with key words, so that translating it into math will become second nature. The first thing you need to do when you are given a word problem is read the whole problem. That is the first, and perhaps the most important thing. You can’t solve for anything if you don’t know what is being asked. After you read the whole problem, see what you’ve been given, and find your unknowns. The second thing you need to do is move in an orderly fashion. Again, identify the things that you still need in order to be able to solve the problem. Use variables to label the unknowns, and use variables that are obvious in representing what they symbolize. Make a sketch of what is going on in the problem, and mark everything that is being represented in your picture. It may also be helpful to write out and put into words why you are doing what you are doing. You want to be very sure that you are grasping what is being asked in the problem. The reason this is important is because, moving in an orderly fashion will help you to think and function in a clear and concise way. It’s not fun to put a lot of work into solving a problem, and then realize, towards the end, that you’ve gotten lost somewhere along the way. Clearly identifying variables, and working orderly will help eliminate any confusion. The last thing we will talk about is recognizing which words signify which mathematical operations. Now, I will be giving you a list of words or key phrases that signify that you need to either add, subtract, multiply, divide, or if something is equal. Get familiar with these words and phrases, and practice working through word problems to identify what mathematical operations are being called for. I hope that this video was helpful. For further help, be sure to subscribe to our channel by clicking below.